Sounders must win Thursday’s match outright against Vancouver to guarantee a trip to the Western Conference finals, but injuries are forcing tough choices. 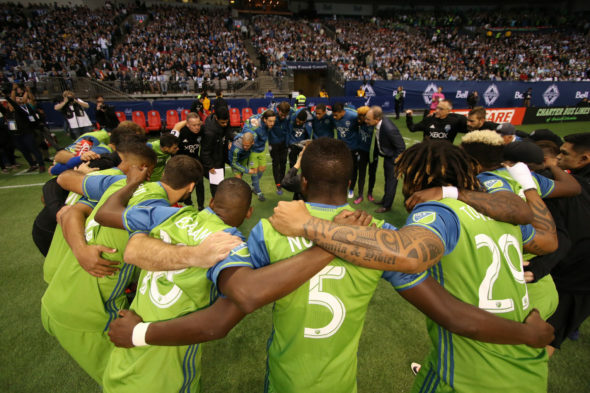 Ahead of a winner-take-all semifinal second leg against the Vancouver Whitecaps Thursday (7:30 p.m., FS1), the Seattle Sounders still have lineup questions due to lingering injuries picked up late in the season. Tied 0-0 on aggregate after the first leg in Vancouver, the Sounders must win the match at CenturyLink Field to advance to the Western Conference finals. Sounders head coach Brian Schmetzer said he expected his side to execute after the first leg, in which one shot on goal was made between both teams. Which players will decide the game is the hard decision facing Schmetzer. Asked who was definitely out, Schmetzer offered up Brad Evans, done for the season with a lower back injury, and Jordan Morris, who has been laid low with a long-term hamstring strain and has not played since Sept. 10. Still on the bubble are Victor Rodriguez (quad strain), Osvaldo Alonso (lateral quad strain) and center back Chad Marshall (hip strain). Gustav Svensson, who missed a game with a hamstring strain before entering the first leg as a sub, may be forced to fill an important back-line role if Marshall is unable to play. Schmetzer remained customarily tight-lipped when discussing which of his dinged-up players would be available. Schmetzer’s dilemma is difficult. If he puts in a player not fully healthy, and he requires an early substitution, it limits Schmetzer’s ability to make tactical changes later in the game. As with most MLS squads, there is a significant drop-off between Schmetzer’s primary group of players and his backups. Fielding a weaker lineup may mean an early offseason for Seattle. One player guaranteed to see the field is Clint Dempsey, returned from a red card suspension in the final match of the regular season. The Sounders beat the Whitecaps 3-0 at home the last time they faced on Sept. 27, the same match where Alonso was injured. While the win guarantees Seattle advances, a draw featuring any amount of goals puts Vancouver through on the away-goals tiebreaker. A scoreless draw would lead to extra time and possibly penalty kicks. Schmetzer said he expected his side to be aggressive in seizing control.